the concept of “fair use”. Several authors offer insightful comments on the ways in which the Wittem Group’s draft European Copyright Code propounds some of these issues. Recognizing that the existing steps towards harmonized copyright protection in Europe have gone little farther than a patchwork of eight directives and a set of case law interpretation rules, the authors take important steps towards decrypting the gaps and inconsistencies in the existing common legal framework. 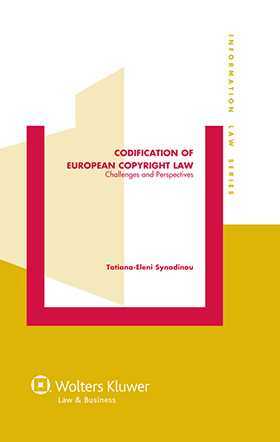 In their reexamination of the sources and justifications of copyright law and its crucial role in balancing the right to information with requirements of data protection and privacy, they have created in this book an in-depth resource for forward-looking policymakers, academics, and practitioners in the field of copyright law throughout the European Union. Please click here to view a sample chapter. Part 1: The Methods of European Copyright Harmonization. Chapter 1. The Legal Foundations of European Copyright Law; T. Georgopoulos. Chapter 2. The European Legislator’s Strategy in the Field of Copyright Harmonization; F. Gotzen. Chapter 3. The Plurality of Legal Systems in Copyright Law: An Obstacle to a European Codification? P. Jougleux . Chapter 4. CJUE Policy and Practice in the Field of European Copyright Law; D. Kallinikou . Part 2: The acquis of European Copyright Harmonization. Chapter 1. The Foundations of the Concept of Work in European Copyright Law; T.-E. Synodinou. Chapter 2. The acquis communautaire in the Area of Copyright and Related Rights: Economic Rights; A. Lucas-Schloetter. Chapter 3. Defining the Scope of Protection of Copyright in the EU: The Need to Reconsider the acquis Regarding Limitations and Exceptions; C. Geiger, F. Schönherr. Chapter 4. Duration of Copyright and Related Rights; H. Pisuke. Chapter 5. Enforcement of Intellectual Property Rights; P. Cámara Águila. Part 3: The Gaps in European Copyright Harmonization. Chapter 1. Authorship and Ownership: Authors, Entrepreneurs and Rights; A. Quaedvlieg. Chapter 2. Moral right; I. Kikkis. Chapter 3 . Copyright Contracts; S. von Lewinski. Chapter 4. An Essential Brick in the European Copyright Building: A Regulation of Copyright Transactions; J. de Werra. Chapter 5. The Legal Struggle in the EU against Online Piracy; I. Iglezakis. Chapter 6. Interoperability and European Copyright Law Codification; C. Bernault. Part 4: Perspectives and Reflections on the European Codification of Copyright Law. Chapter 1. The Perspective of the Introduction of a European Fair Use Clause; P.L.C. Torremans. Chapter 2 . The Wittem Group’s European Copyright Code; P.B. Hugenholtz. Chapter 3. Reflections on a European Copyright Codification; R. Hilty . Chapter 4 . European Copyright Codification; A. Lucas.